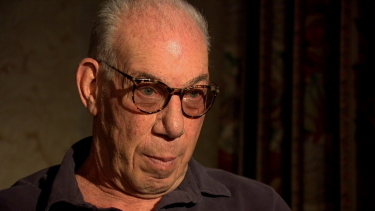 'BBS' stands for the production team of Bert Schneider, Robert (Bob) Rafelson and Steve Blauner. 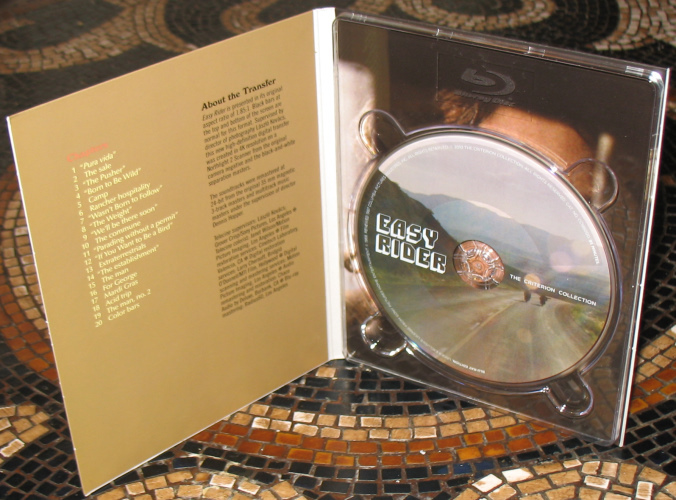 Case: Custom Blu-ray-height case. 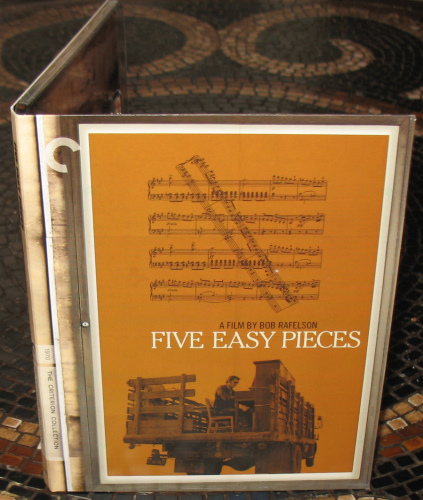 6 Bookstyle flap cardboard cases including a 114-page book featuring color photos and essays by critics J. Hoberman, Chuck Stephens, Matt Zoller Seitz, Kent Jones, Graham Fuller, and Mark Le Fanu - inside a sturdy box (see images below). Description: Like the rest of America, Hollywood was ripe for revolution in the late sixties. Cinema attendance was down; what had once worked seemed broken. Enter Bob Rafelson, Bert Schneider, and Steve Blauner, who knew that what Hollywood needed was new audiences—namely, young people—and that meant cultivating new talent and new ideas. 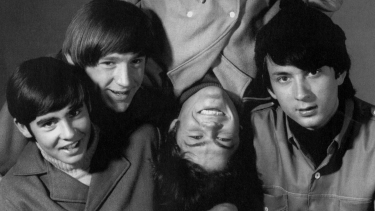 Fueled by money from their invention of the superstar TV pop group the Monkees, they set off on a film-industry journey that would lead them to form BBS Productions, a company that was also a community. 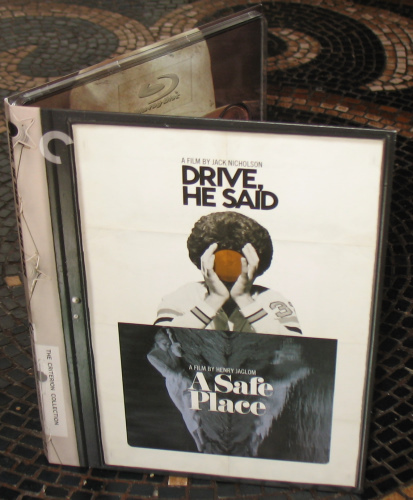 The innovative films produced by this team between 1968 and 1972 are collected in this box set—works that now range from the iconic (Easy Rider, Five Easy Pieces, The Last Picture Show) to the acclaimed (The King of Marvin Gardens) to the obscure (Head; Drive, He Said; A Safe Place), all created within the studio system but lifted right out of the countercultural id. During the height of Monkeemania, the band was advertised on everything from magazines and dolls, to trading cards and Christmas cards, so it seemed like a feature film starring the Pre-Fab Four should be a hit. Unfortunately Head was a failure due to the fact that the band's teenybopper fans expected a rehash of the TV show's light humor, and instead got a surreal, and slightly dark, satire. Description: Hey, hey, it’s the Monkees . 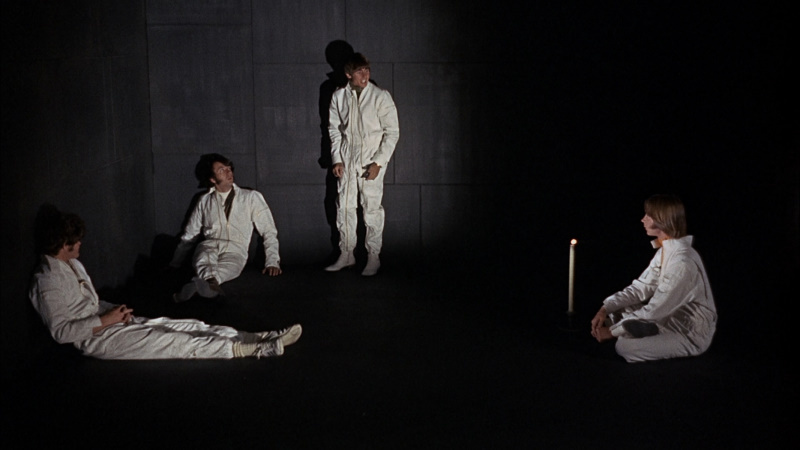 . . being catapulted through one of American cinema’s most surreal sixties odysseys. The brainchild of Bob Rafelson, making his directorial debut; his producing partner and Monkees cocreator Bert Schneider; and Jack Nicholson, a coscreenwriter on the project, Head was the fanciful beginning and ignominious end of the TV-bred supergroup’s big-screen career. 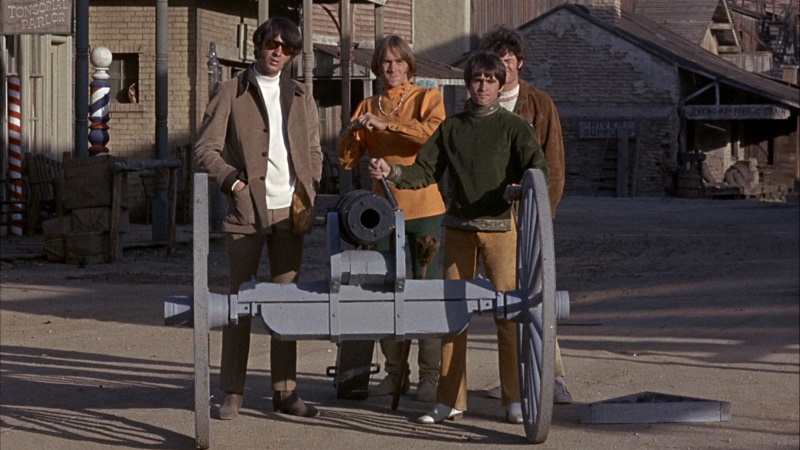 In it, Micky Dolenz, Davy Jones, Michael Nesmith, and Peter Tork become trapped in a kaleidoscopic satire that’s movie homage, media send-up, concert movie, and antiwar cry all at once. A constantly looping, self-referential spoof that was ahead of its time, Head dodged commercial success on its release but has since been reclaimed as one of the great cult objects of its era. 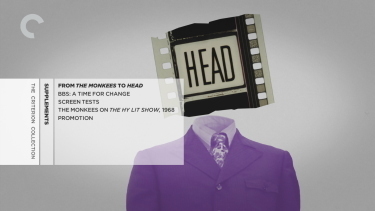 Rafelson's first feature, made when Monkee mania had all but died, Head proved too experimental for the diminishing weenybop audience which had lapped up the ingenious TV series. It flopped dismally in the US, and only achieved belated release here. Despite obviously dated aspects like clumsy psychedelic effects and some turgid slapstick sequences, the film is still remarkably vital and entertaining. 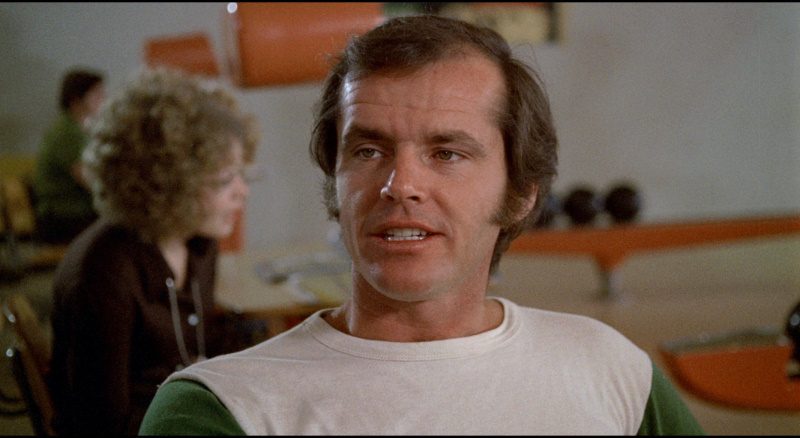 Rafelson (who helped to create the group), together with Jack Nicholson (co-writer and co-producer), increased the TV show's picaresque tempo while also adding more adult, sardonic touches. 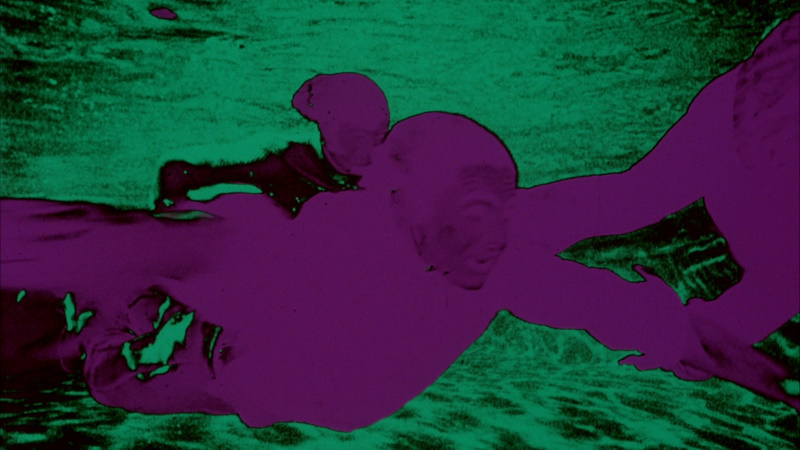 The calculated manipulation behind the phenomenon is exposed at the start, when the Monkees metaphorically commit suicide. 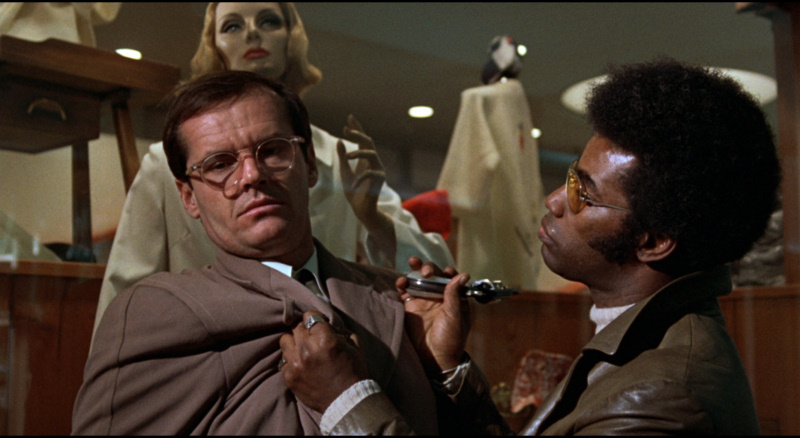 The typical zany humour is intercut with harsher political footage and satire on established genres of American cinema, exploding many a sacred cow into the bargain. 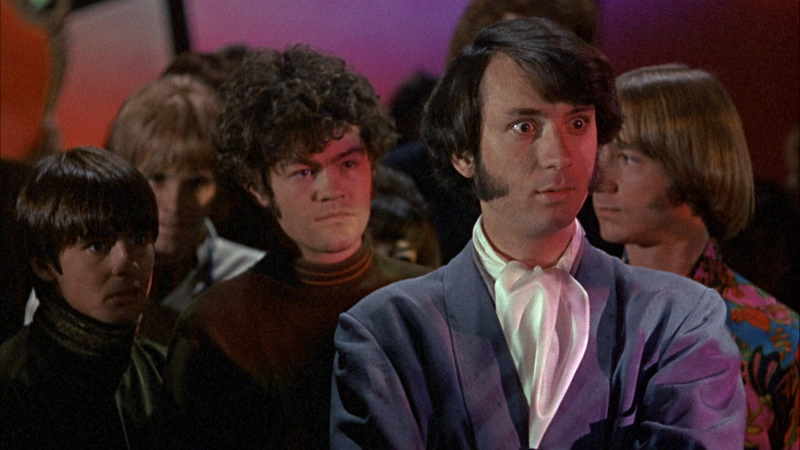 After NBC canceled their innovative sitcom, the Monkees and their TV brain trust, Bob Rafelson and Bert Schneider, hatched this big-screen psychedelic freak-out (1968), a narrative cul-de-sac of genre parodies, musical numbers, smug antiwar statements, and bilious McLuhan-esque satire. Scripted by Rafelson and Jack Nicholson (who would next collaborate on Five Easy Pieces), it's uneven but mostly a blast, with great tunes like Harry Nilsson's “Daddy's Song,” Michael Nesmith's barn burner “Circle Sky,” and Gerry Goffin and Carole King's grandiose “Porpoise Song.” Rafelson directed; with cameos by Nicholson, Dennis Hopper, Frank Zappa, Annette Funicello, Sonny Liston, Teri Garr, and Victor Mature. 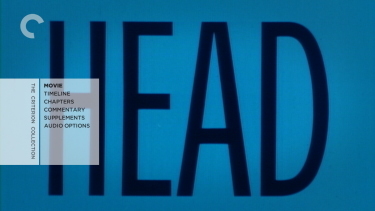 Head looks very good on Criterion's 1.78:1 dual-layered Blu-ray transfer. It doesn't look overly smooth and glossy - more accurately due to the age and production stock. 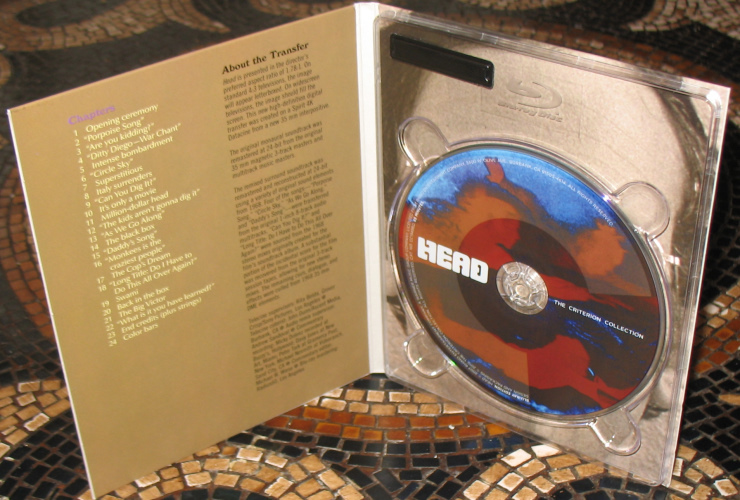 Head is filled with quick cuts and psychedelic tie-dye color effects - that look explosively vibrant in 1080P. This keeps it an off-beat, hammy, fun, ride. It's akin to a Monkees version of The Magical Mystery Tour. There is a smattering of textured grain visible and the image is very clean. It may look the least dynamic of the releases in the America Lost and Found Boxset - but that isn't necessarily a detraction. The high bitrate supports that idea that it's hard to doubt it could look any better for your home theater. Likewise, the DTS-HD Master 5.1 track at a healthy 3829 kbps does its part in supporting the music and occasional effects sounds. 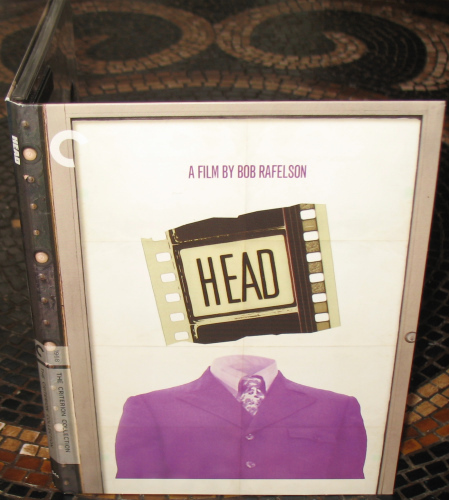 This Blu-ray probably looks like the film Head did originally but probably sounds even better. Separations aren't abundant but there is some nice subtle depth and crispness for the music. As with all the discs in this package, Criterion offer optional English subtitles on their 6 region 'A'-locked Blu-ray discs. There was an all-region NTSC DVD HERE (in a reported 1.66:1 aspect ratio) that but it didn't have the fun commentary, recorded in the Summer of 2010, included here that nostalgically harkens right back to that less-serious time of irreverent youthful amusement. It has the 4 Monkees! - Tork, Nesmith, Jones and Dolez joking their way through - it's great! 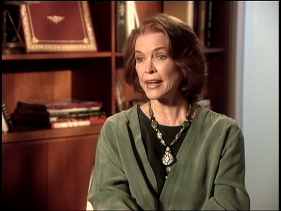 There is a lot more with included in the supplements with a new 1/2 hour video interview with director Bob Rafelson discussing the Monkees phenomenon entitled 'From The Monkees to Head'. 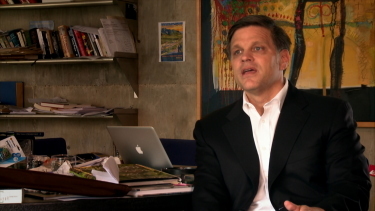 There is another 30-minute documentary about BBS featuring critic David Thomson and historian Douglas Brinkley. 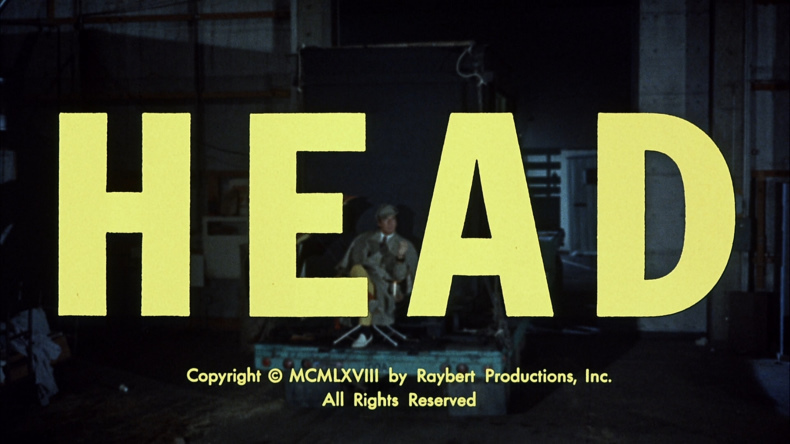 We get some cool little screen tests with the funky Simean-lads, some vintage trailers, TV and radio spots plus the 6.5-minute Ephemera with behind-the-scenes photos by Henry Diltz. 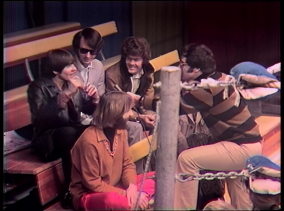 Lastly there is a rare television interview (The HY Lit Show - from 1968) with the Monkees sitting in a boxing arena for 5-minutes answering questions. Description: As Billy and “Captain America,” Dennis Hopper and Peter Fonda motored down the highway on their Harley Davidsons to the roaring strains of Steppenwolf’s “Born to Be Wild,” the definitive counterculture blockbuster was born. 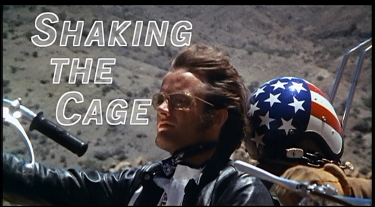 Former clean-cut teen star Hopper’s down-and-dirty directorial debut, Easy Rider heralded the arrival of a new voice in film, one pitched angrily against the mainstream. After Easy Rider’s cross-country journey—with its radical, New Wave–style editing, outsider-rock soundtrack, revelatory performance by a young Jack Nicholson, and explosive ending—the American road trip would never be the same. 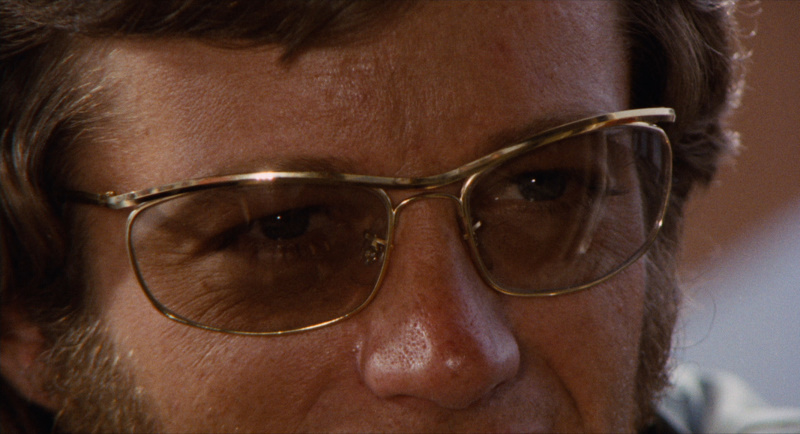 If you follow the story closely in "Easy Rider," you find out it isn't there. The rough-cut of the movie reportedly ran over three hours, and Hopper edited it to a reasonable length by throwing out the story details and keeping the rest. So the heroes are suspended in an invisible story, like falcons on an invisible current of air. You can't see it, but it holds them up. All of this divests a motorcycle movie of its weak point (the story) and develops its strong point (the role of the self-proclaimed rebel in a conformist society). It's not just bike freaks who get in trouble when they challenge the establishment -- it's everybody, even Old George. 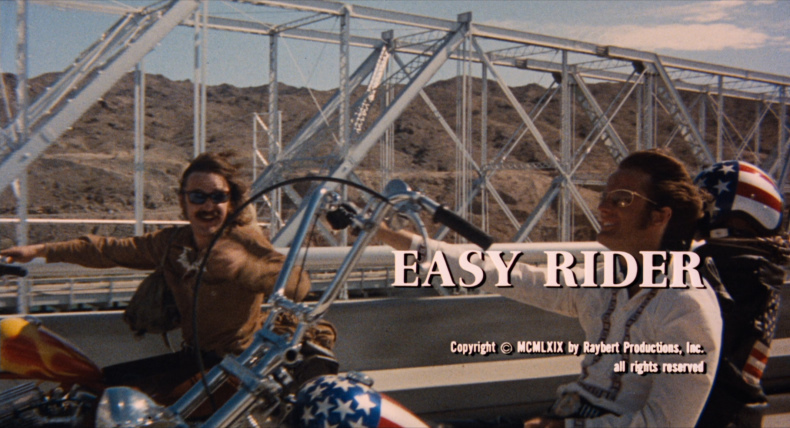 And yet, "Easy Rider" suggests, it's not as simple as that. We almost forget that the Fonda and Hopper characters have also sold out. Victims can sell out just as well as their persecutors. They sold out because what they were trying to be was the mirror image of the rednecks in the truck, and neither life-style is healthy. 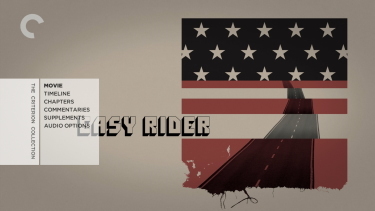 And so there they were, their gas tanks stuffed full of bribes from the establishment, and you remember hearing somewhere that, in the South, "easy rider" is slang for a prostitute's lover. 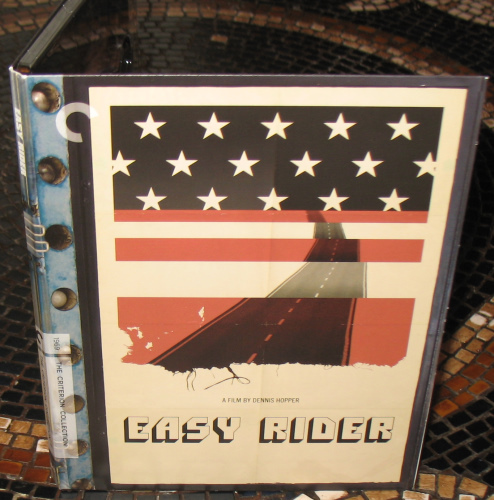 Easy Rider is an important addition to the America Lost and Found Boxset. The transfer is advertised as '...supervised by director of photography L�szl� Kov�cs' and Criterion appear to have technically advanced upon the October 2009 Sony Blu-ray with a higher file size and bitrate. The transfer cools the skin-tones a shade and may have a bit thicker grain supporting a more film-like appearance. It's not a deal breaker in my opinion but I like the way the Criterion looks - I find it marginally more realistic. Contrast exhibits healthy, rich black levels. Daylight scenes are more impressive but nothing is overly dark. It looks just great. Audio also advances upon the previously released Sony 1080P transfer with two DTS-HD Master tracks - one in 5.1 at 3713 kbps - the second in original mono at 2018 kbps. Note there is also a standard Dolby Digital 2.0 channel track. 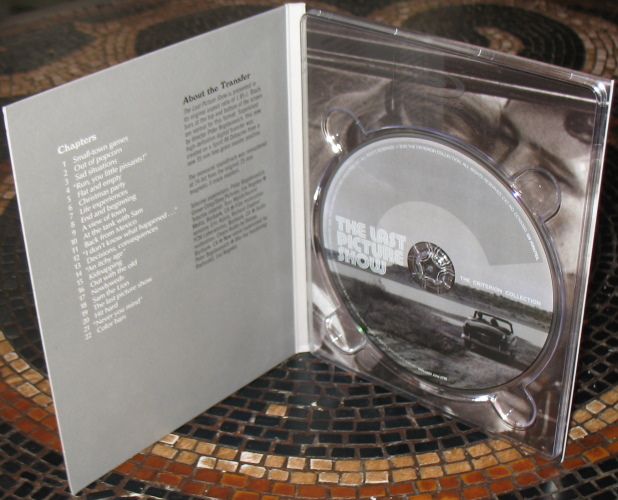 The surround track is buoyant with some impressive depth when called upon. You can't really go wrong with lossless and it's appropriate to add the original option in HD. The music is such an important part of the film - and it van sound just amazing - recall Born to Be Wild by Steppenwolf, The Weight – The Band, Wasn’t Born to Follow – The Byrds, San Franciscan Nights – Eric Burdon & The Animals, The Pusher – Steppenwolf, It’s Alright Ma – Roger McGuinn, Nights in White Satin – Moody Blues, Get Together – Youngbloods... it just goes on and on. So the Criterion bests the competent Sony Blu-ray on a/v (and extras - see below) - not surprising to this reviewer. 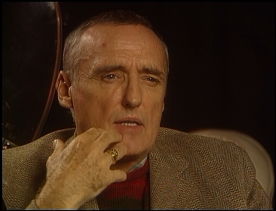 Two audio commentary tracks are available; the same one with actor-director-writer Dennis Hopper from 2000 - with plenty of gaps and not directly relating to the onscreen activity, but still containing decent information. 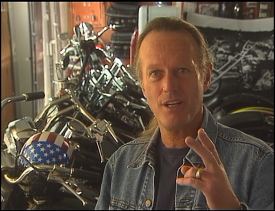 The other, from 1995, is with Hopper, actor-writer Peter Fonda, and production manager Paul Lewis. 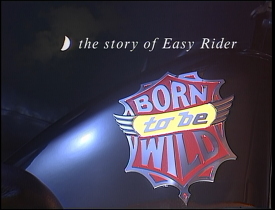 Born to Be Wild is a half-hour BBC2 television programme from 1995 by Nicholas Freand Jones about the history of the film and more thorough is the 1999 Charles Kisleyak “Easy Rider”: Shaking the Cage documentary featurette as also found on the Sony Blu-ray. 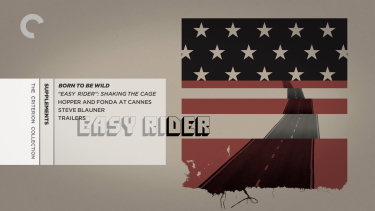 It details the cultural impact of Easy Rider and it is always special to hear Fonda talk about the film - and casual reminisces with many of the cast (actors Luke Askew, Karen Black, and Seymour Cassel) - sans Jack. 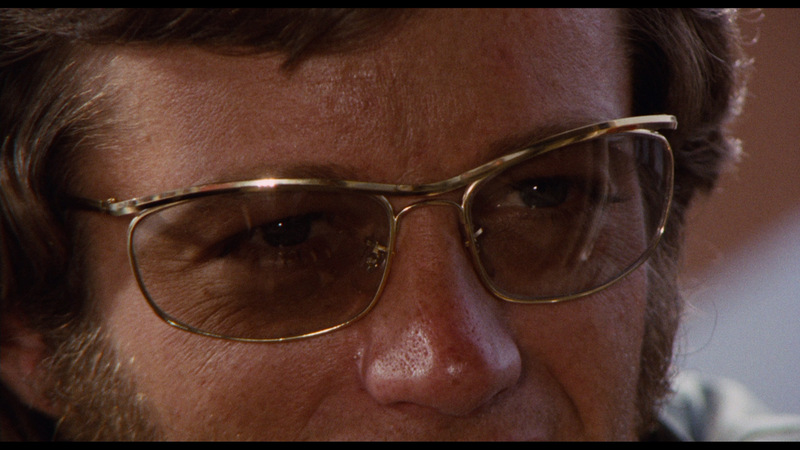 There are segments of Easy Rider scenes interspersed with the comments. 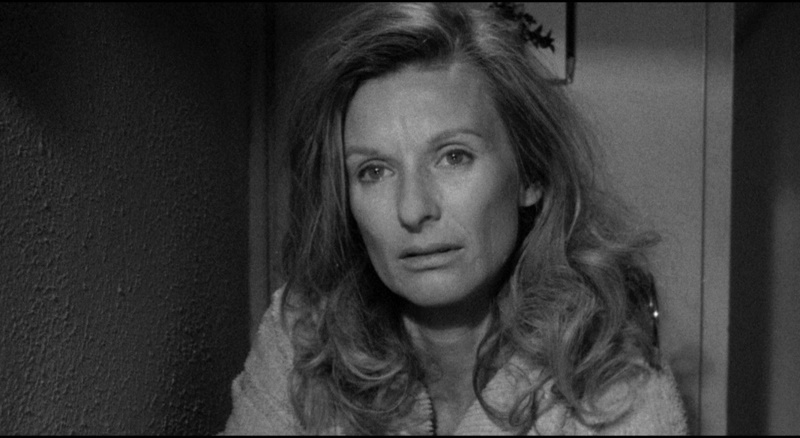 Tack on 2-minutes of television excerpts showing Hopper and Fonda at the Cannes Film Festival, directed by Pierre Mignot - aired May 22nd, 1969, and a new video interview with Steve Blauner (the 'S' in BBS) - shy of 20-minutes - recorded for Criterion in Los Angeles 2010. There are also 2 theatrical trailers (2:50 + :57). You couldn't ask for much more here - it is an incredible collection of extras. 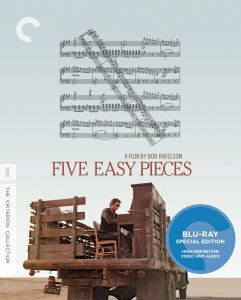 Description: Following Jack Nicholson’s breakout supporting turn in Easy Rider, director Bob Rafelson devised a powerful leading role for the new star in the searing character study Five Easy Pieces. Nicholson plays the now iconic cad Bobby Dupea, a shiftless thirtysomething oil rigger and former piano prodigy immune to any sense of romantic or familial responsibility, who returns to his childhood home to see his ailing, estranged father, blue-collar girlfriend (Karen Black) in tow. Moving in its simplicity and gritty in its textures, Five Easy Pieces is a lasting example of early 1970s American alienation. 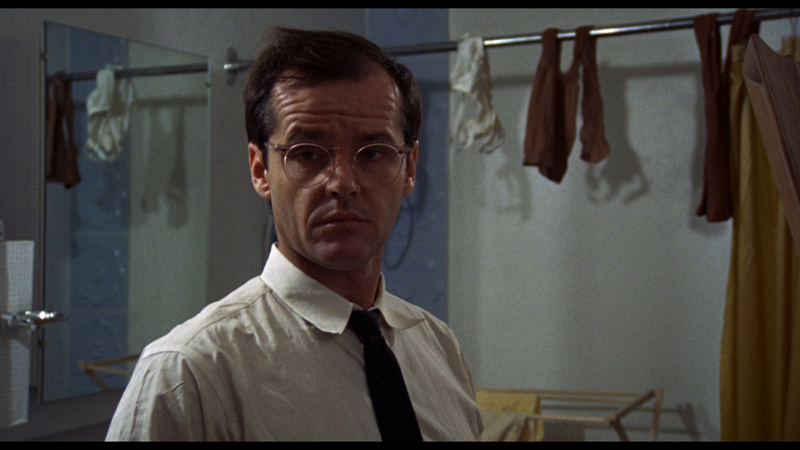 Jack Nicholson was never going to be another Jimmy Stewart. 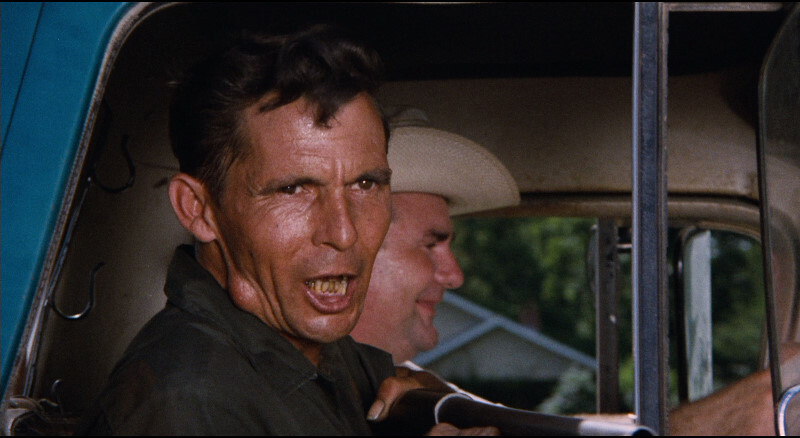 As early as his prefame days (in 1960s TV Westerns and Roger Corman cheapies), there was too much attitude, too much snarl. Instead, he became the symbolic actor of the counterculture; his Hollywood ascent was as much a signal of change as the rises of Coppola and Scorsese. 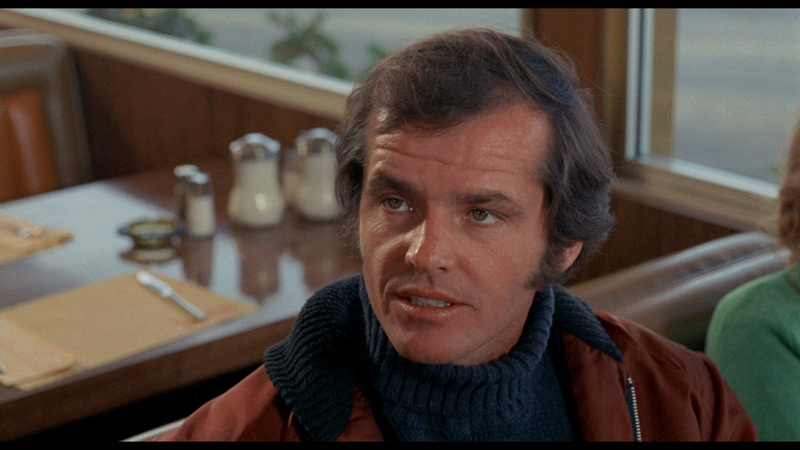 Five Easy Pieces, a brilliant gem of American psychological realism (where are these movies today? 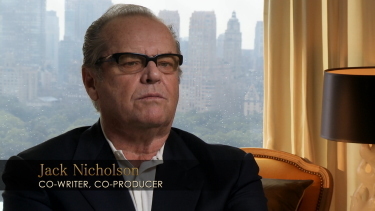 ), is Nicholson’s arrival to the A-list. His Bobby Dupea flees a privileged upbringing, replacing it with grimy work in oil fields; there’s some serious denial here, some buried self-contempt. The beauty of the film, though, cowritten by director Bob Rafelson and Carole Eastman (credited as Adrien Joyce), is that it avoids that contempt for its characters. 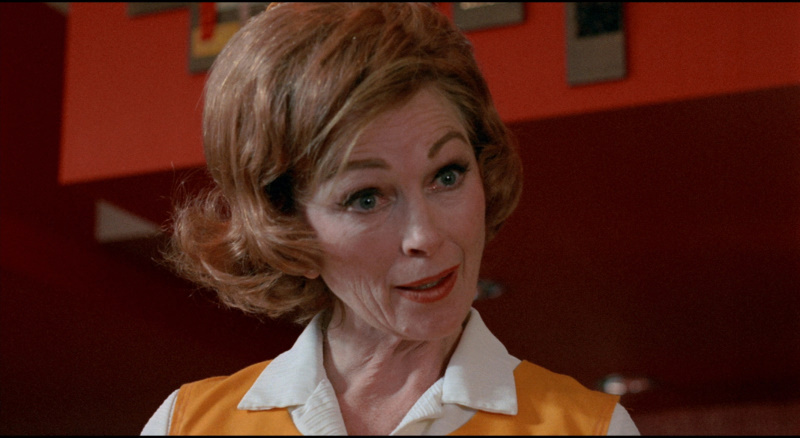 Bobby’s fun-loving girlfriend, Rayette, is mental leagues beneath him, but as brought to life by the boisterous Karen Black, you immediately come to love her Tammy Wynette obduracy and pouty fits. Improbably, the two head back to Bobby’s wealthy home, to make peace with his dying father and stroll down the piano keys of our hero’s prodigy past. 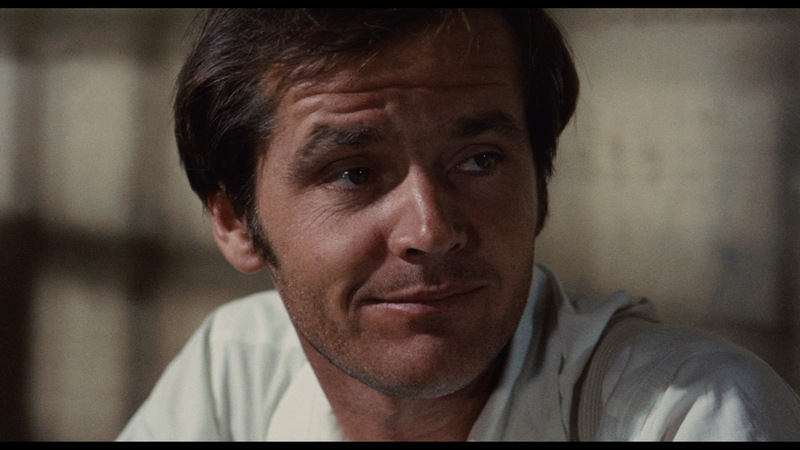 The movie is best known for a classic tell-off in a diner, but watch Nicholson’s eyes as he says it. The man is damaged and needs help..
Jack Nicholson plays the poignantly named Robert Eroica Dupea, an angry, insubordinate smartmouth precariously employed as an oil-rigger out west, and trapped in a toxic relationship with Rayette (Karen Black), a diner waitress and would-be country singer. It is only when we learn that his father is dying, and Robert must travel back to the family home in Washington state for a last goodbye, that we learn that Robert is in retreat from his poisoned vocation: once a brilliantly promising classical pianist, he has angrily given up music, having failed to reach the standards set by his father and by himself. So Robert and poor, uncomprehending Rayette are guests in his ramshackle family home chock-full of decaying and defeated musical talent, like something from Dickens or Chekhov. His pianist sister Partita, played by Lois Smith, is sabotaging her own career with a bad habit of humming along to her own performance in the recording studio, like Glenn Gould. 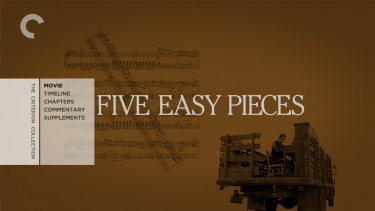 Robert attempts to seduce his brother's girlfriend Catherine (Susan Anspach) by playing her an easy piece by Chopin, and angrily declares he played it better, more valuably and with more integrity when he was eight years old. Image /Audio: This is one of Jack's most memorable performances and fittingly the image quality may be the best in the America Lost and Found Boxset. The transfer is again advertised as '...supervised by director of photography L�szl� Kov�cs' and it looks beautiful with vibrant colors, strong detail in close-ups and a reasonable thickness and depth authentically representing film. I don't have much more to add - the very high bitrate supports the dual-layered transfer with an impressively flawless appearance. Blu-ray should always look this 'true'. 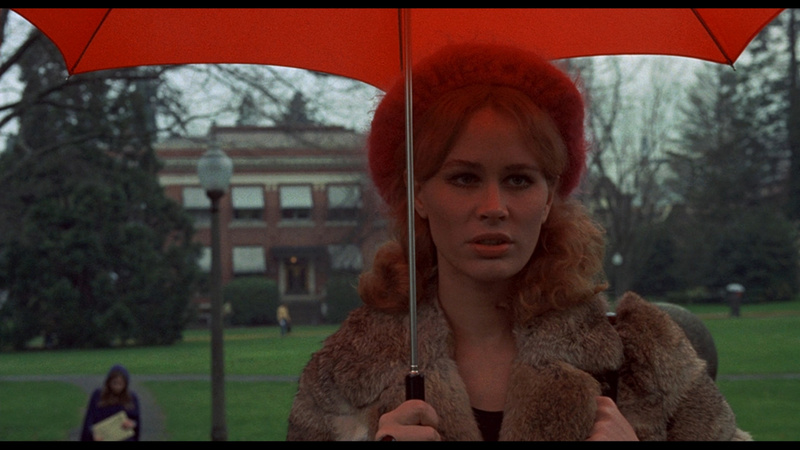 Contrast is at Criterion's high standard and Five Easy Pieces visuals are immaculate. Audio is a modest linear PCM mono track at 1152 kbps faithfully representing the film. It's dutifully flat but has some perceived depth in a few instances of Robert's (Jack's) aggression. Dialogue is consistent and clean. 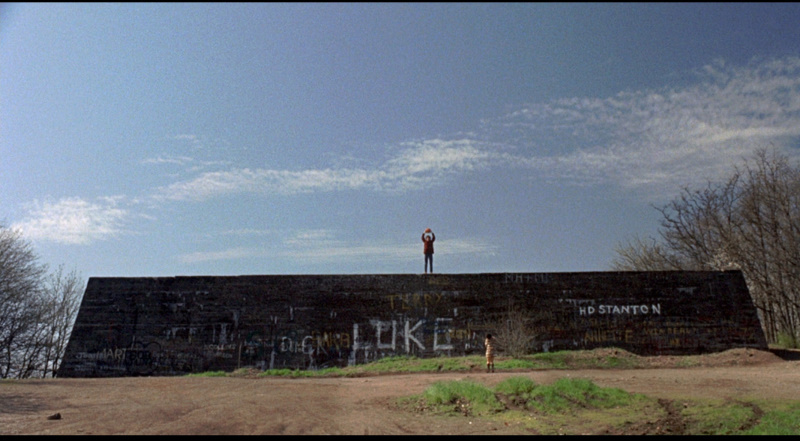 This is a sweet a/v transfer doing justice to the masterpiece film - kudos to Criterion. 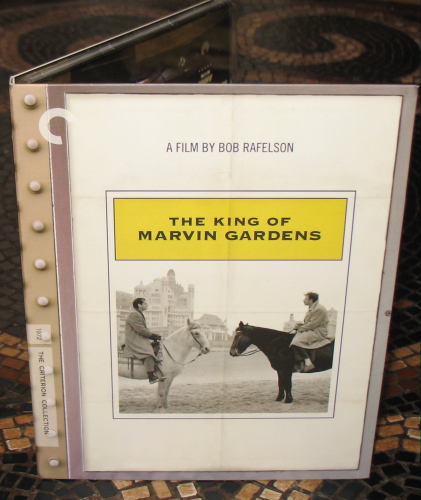 Supplements don't disappoint with a new audio commentary featuring director Bob Rafelson and interior designer Toby Rafelson. 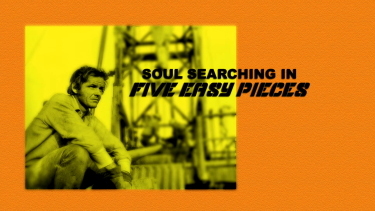 Soul Searching in “Five Easy Pieces,” is a 10-minute video piece from 2009 with Rafelson discussing the writing and development of Five Easy Pieces. 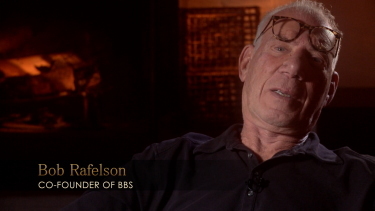 Most interesting is The BBStory, a 2009 documentary about the BBS era, with Rafelson, actors Jack Nicholson, Karen Black and Ellen Burstyn, and directors Peter Bogdanovich and Henry Jaglom, among others reminiscing about the ground-breaking films of BBS Productions. It runs over 45-minutes in length. 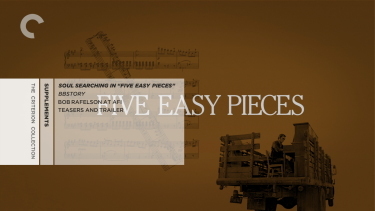 There are some audio excerpts from a 1976 AFI interview with Rafelson and theatrical trailer and teasers from Five Easy Pieces. 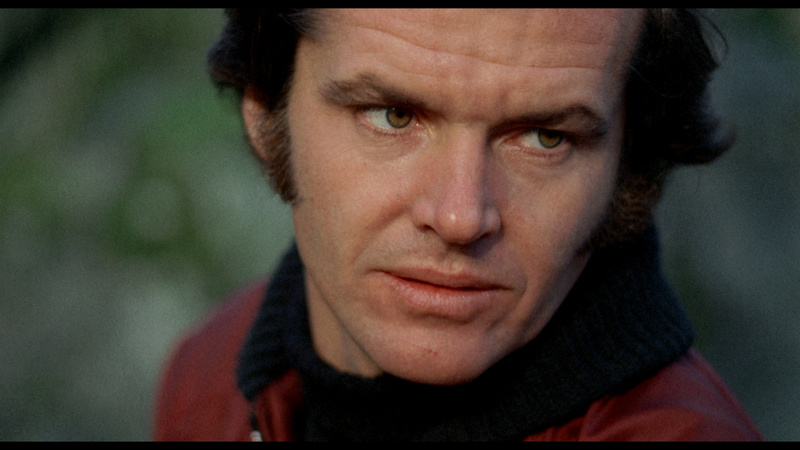 Drive, He Said Description: Fresh off of his Five Easy Pieces success, Jack Nicholson mounted his enormously irreverent directorial debut. 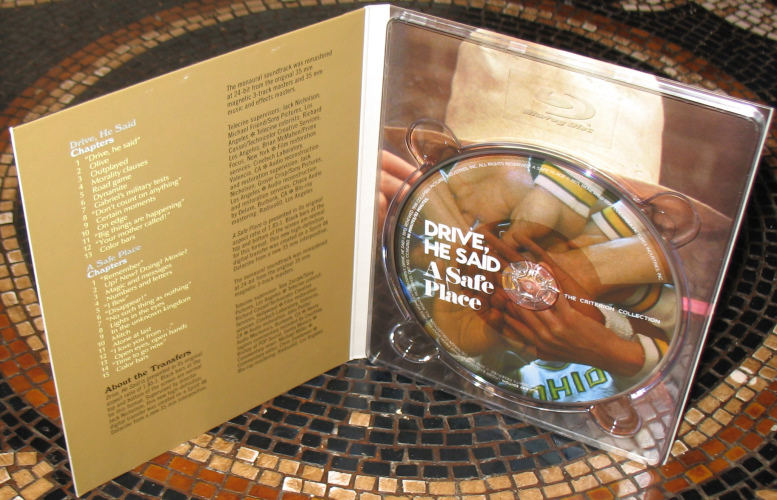 Based on the best-selling novel by Jeremy Larner, Drive, He Said, free-spirited and sobering by turns, is a sketch of the exploits of a disaffected college basketball player (William Tepper) and his increasingly radical roommate (Michael Margotta), as well as a feverishly shot and edited snapshot of the early seventies (some of it was filmed during an actual campus protest). Fueled by Vietnam-era anxieties and perched on the edge of utter insanity, Nicholson’s audacious comedy (also starring Bruce Dern and Karen Black) is a startling howl direct from the zeitgeist. 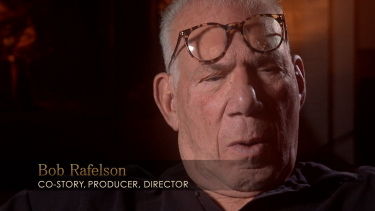 A Safe Place Description: One of the discoveries of the groundbreaking production company BBS was director Henry Jaglom. The fiercely idiosyncratic filmmaker—who would go on to have a decades-spanning career making independently produced female character studies—was first revealed to the film world with A Safe Place. In this delicate, introspective drama, laced with fantasy elements, Tuesday Weld stars as a fragile young woman in New York, unable to reconcile her ambiguous past with her unmoored present; Orson Welles as an enchanting Central Park magician and Jack Nicholson as a mysterious ex-lover round out the cast. 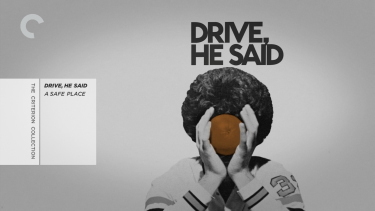 Drive, He Said - The first film to credit Nicholson as director combines his love of basketball with in vogue nihilistic angst. 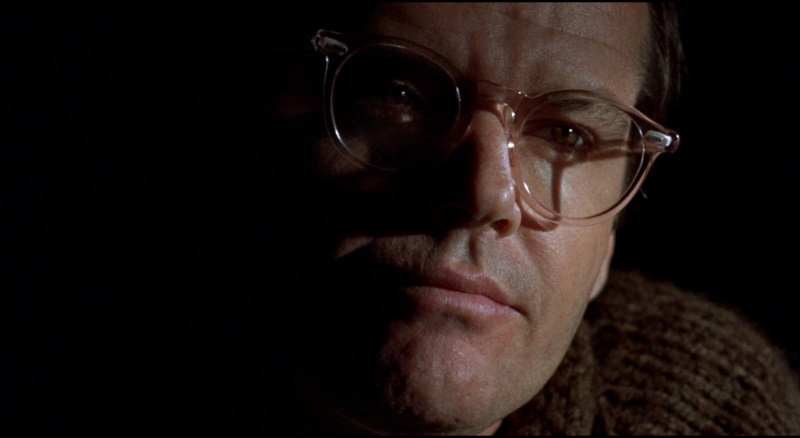 Tepper is the rebellious college student dealing with the trials and tribulations that girlfriends and coaches cause. Dern is terrific as the tough coach, but there is nothing else here that can be claimed as unqualified success. After Easy Rider and to a lesser extent Head, it is admirable that Nicholson was continuing to antagonize and provoke, to keep pushing the envelope. 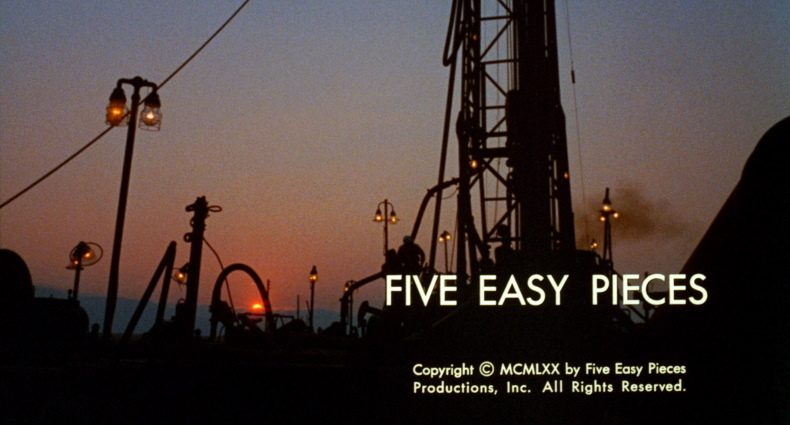 But ultimately, there's no theme here that isn't addressed more coherently and directly in a more conventional film like Five Easy Pieces. 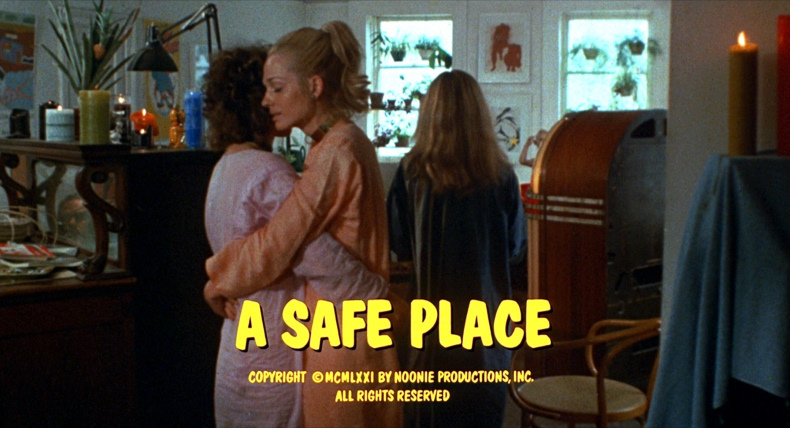 A Safe Place - Jaglom's first feature is a non-narrative fairy story of the emotional vulnerabilities of a young New York girl. Her yearning for past innocence reflects in her relations with a magician of uncertain powers, and in her interweaving fantasy around the two men who serve but can't fulfil her needs. 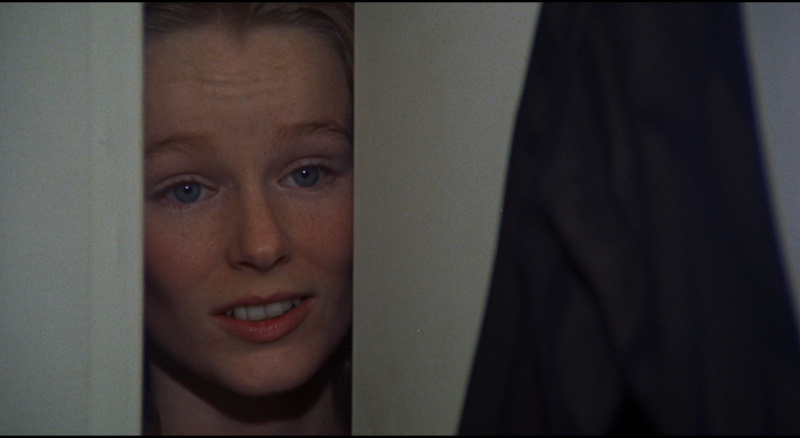 Although a psychological reading is there for the taking, the film also offers a lament on the cinema's loss of magic. The nostalgic songs, the conspicuous presence of Orson Welles as the magician, show how much its roots lie in the past, while the film's experimental structure reveals the impossibility of trying to recapture that past. Despite the non-linear development, Jaglom's composition is sufficiently coherent, and Tuesday Weld's performance adds a real focus point. The result is sometimes indulgent, often fragile, and occasionally enchanting. With Welles as presiding spirit, it's also funnier than you might expect. 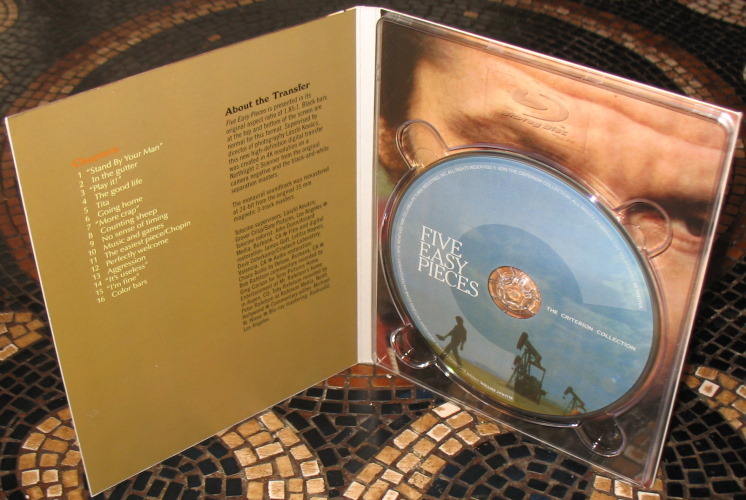 Image /Audio: the two features share one dual-layered Blu-ray disc. 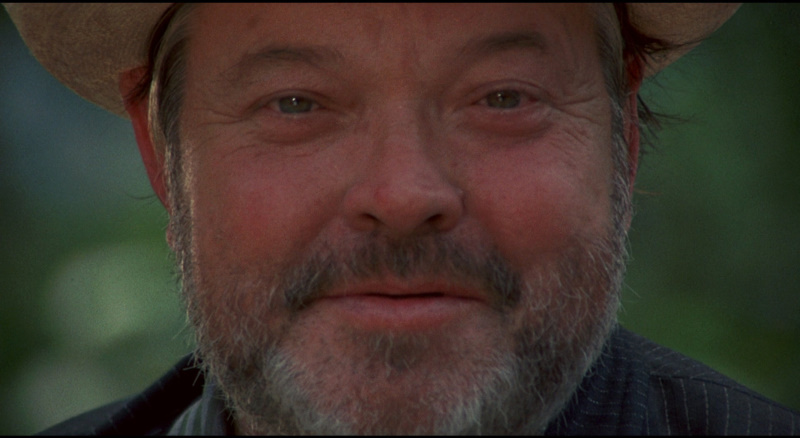 I had not seen either of these films before and enjoyed Nicholson's directorial effort - Welles is always a cracker too. 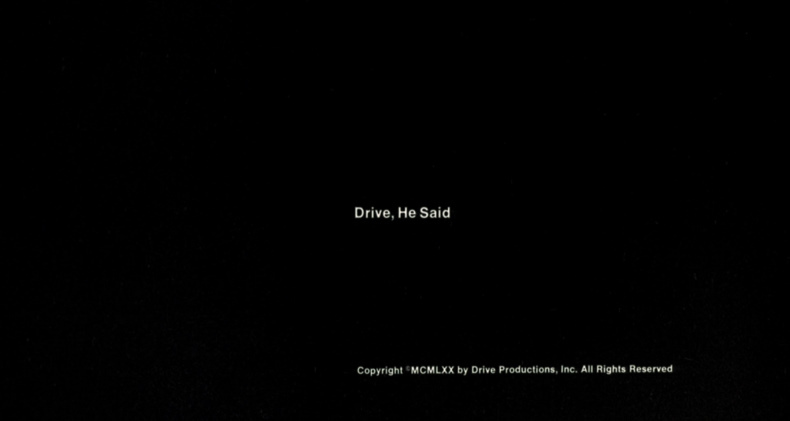 Drive, He Said is advertised as 'New, restored high-definition digital transfer, supervised by director Jack Nicholson'. It looks better than I was anticipating. It is clean, some notable grain and detail is adept. 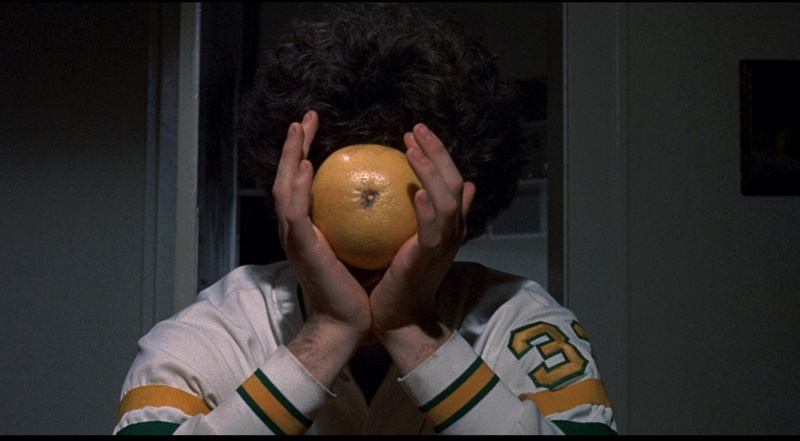 Likewise, A Safe Place, is also a nice transfers - skin tones are warmish but detail may actually be superior to the Nicholson's film but it is equally as clean and has some grain. Both have a lossless linear PCM mono track at 1152 kbps sounding unremarkable and flat but, most likely, accurate to the production roots. 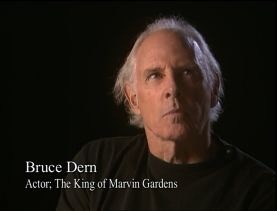 As an extra on Drive, He Said - we get a A Cautionary Tale of Campus Revolution and Sexual Freedom, a 10-minute 2009 video piece featuring Nicholson, actor Bruce Dern, coproducer Harry Gittes and other revisiting the production of the film. There is also a theatrical trailer (2:41). 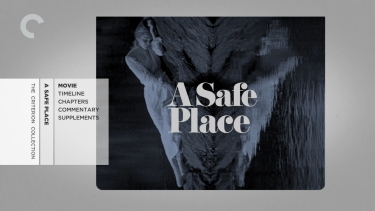 On A Safe Place, there is an audio commentary featuring director Henry Jaglom recorded in 2009-1010. 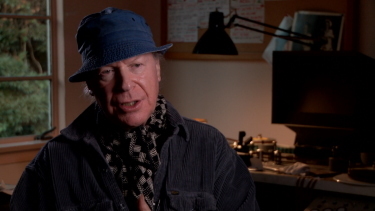 Henry Jaglom Finds “A Safe Place,” in a 2009 video piece in which the director discusses the influence of such filmmakers as Fellini and Cassavetes on his work and the theatrical nature of A Safe Place. 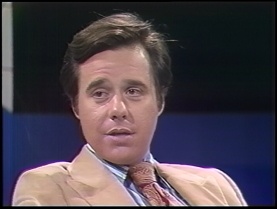 Notes on the 9th New York Film Festival is a 30-minute 1971 video interview with Jaglom and director Peter Bogdanovich who sit with writer Molly Haskell to discuss their films The Last Picture Show and A Safe Place - the only American entries in the Festival that year. There is one Outtake and 4 screen tests (25:25 in total) and a theatrical trailer (2:51). 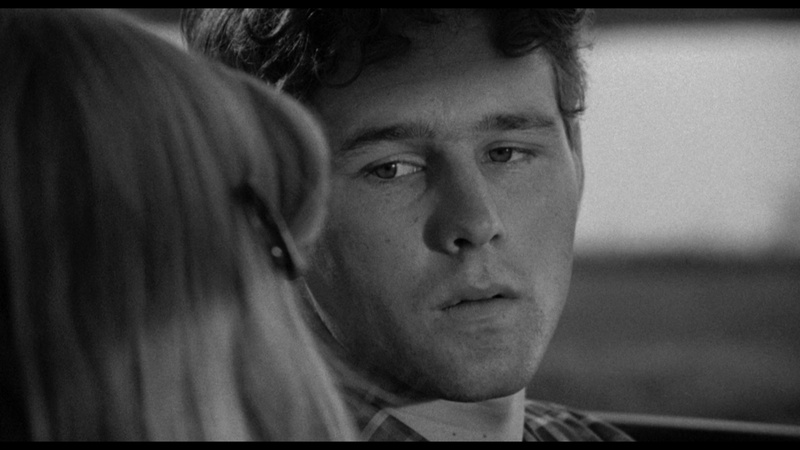 Description: The Last Picture Show is one of the key films of the American cinema renaissance of the seventies. Set during the early fifties, in the loneliest Texas nowheresville to ever dust up a movie screen, this aching portrait of a dying West, adapted from Larry McMurtry’s novel, focuses on the daily shuffles of three futureless teens—the enigmatic Sonny (Timothy Bottoms), the wayward jock Duane (Jeff Bridges), and the desperate-to-be-adored rich girl Jacy (Cybil Shepherd)—and the aging lost souls who bump up against them in the night like drifting tumbleweeds, including Cloris Leachman’s lonely housewife and Ben Johnson’s grizzled movie-house proprietor. 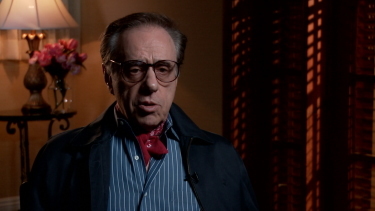 Featuring evocative black-and-white imagery and profoundly felt performances, this hushed depiction of crumbling American values remains the pivotal film in the career of the invaluable director and film historian Peter Bogdanovich. 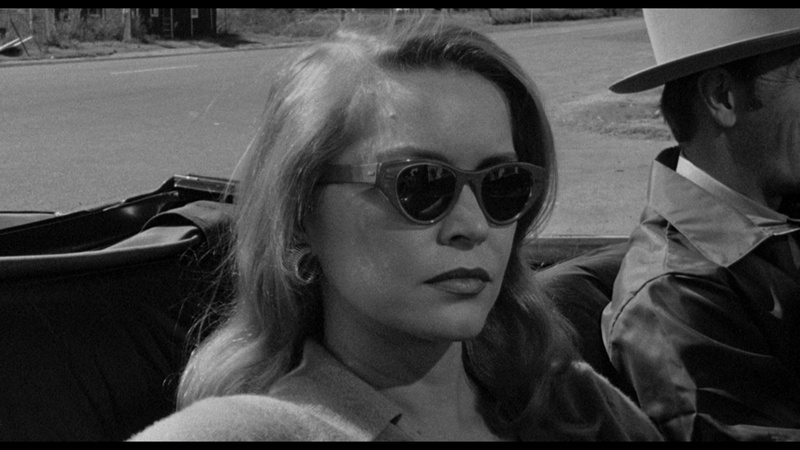 One could argue that Peter Bogdanovich never topped The Last Picture Show (1971), his second feature and surely one of the great films of the Seventies. This is due not only to Bogdanovich's direction, but also the strength of the original source material (the 1966 novel of the same title by Larry McMurtry), its excellent ensemble cast, and its gritty black-and-white cinematography by the Hollywood veteran Robert Surtees. A basic part of the film's success arises from its authentic portrayal of small-town life, which it derives from the novel. Texas-born writer Larry McMurtry has had an unusually close, career-long relationship with the film medium. 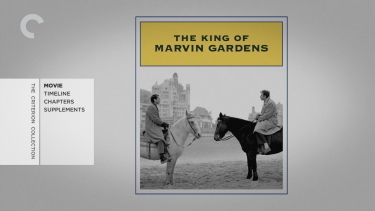 His first novel, Horsemen, Pass By (1961) was adapted into no less a film than Martin Ritt's Hud (1963). The reason for this is not difficult to fathom: McMurtry's depictions of small-town life in the West, with their unsparing but compassionate examination of stunted lives and their ironic echoes of the Western genre, offered strong material for filmmakers interested in exploring adult subjects. Other significant adaptations of McMurtry novels include Terms of Endearment (1983), the TV miniseries Lonesome Dove (1989), Texasville (1990)--a sequel to The Last Picture Show, and The Evening Star (1996). 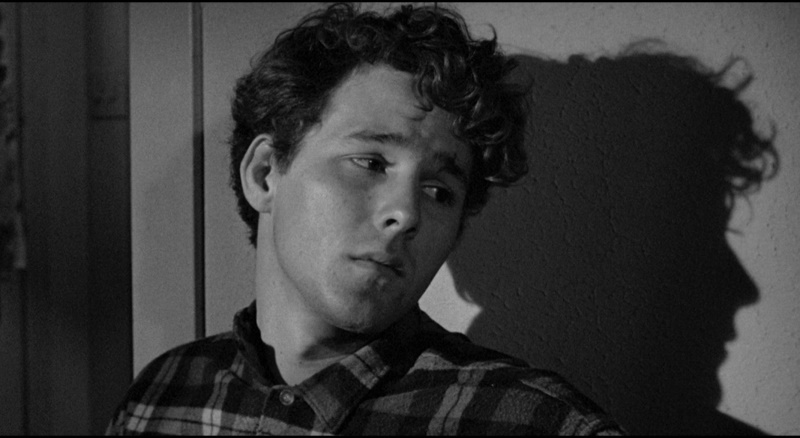 The Last Picture Show is not sociology, even though it is sociologically true, nor is it another exercise in romantic nostalgia on the order of Robert Mulligan's Summer of '42. It is filled with carefully researched details of time and place, but although these details are the essential decor of the film, they are not the essence. 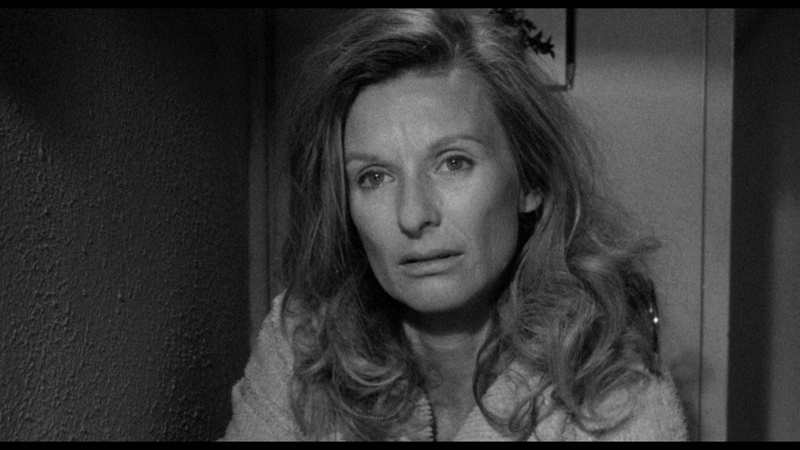 It is a movie that doesn't look back; rather, it starts off and ends in its own time, as much as does such a completely dissimilar, contemporary story as that of Sunday, Bloody Sunday. 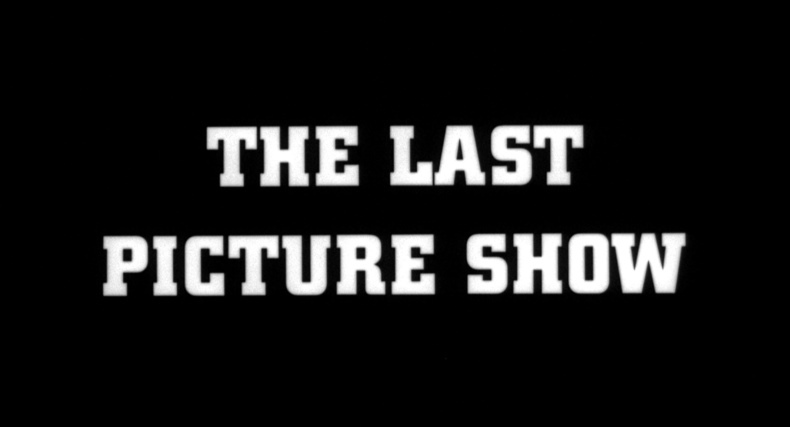 The Last Picture Show is about both Anarene and Sonny Crawford, the high school senior and football cocaptain (with his best friend, Duane Jackson, of the always defeated Anarene team), through whose sensibilities the film is felt. 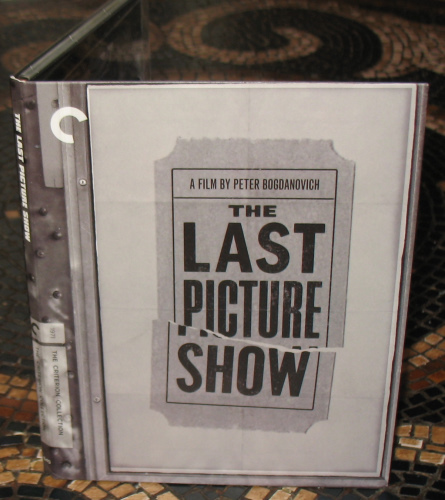 As Bogdanovich seldom takes his story very far from Anarene, he sees The Last Picture Show entirely in terms of the maturation of Sonny, in the course of the emotional crises and confrontations that have become the staples of all sorts of American coming-of-age literature, from Penrod to Peyton Place and Portnoy's Complaint. Image /Audio: Some may consider this the weakest of the six transfers of the boxset but I don't doubt the authenticity of the appearance. This is advertised as 'digital transfer of Peter Bogdanovich’s director’s cut, supervised by Bogdanovich'. It is thick with course grain and little depth but the rougher appearance is fitting to the film's black and white rustic style. Detail is not as pristine as some may have come to expect from the format but it is adhering to the film source with a flat, glossless, appearance. 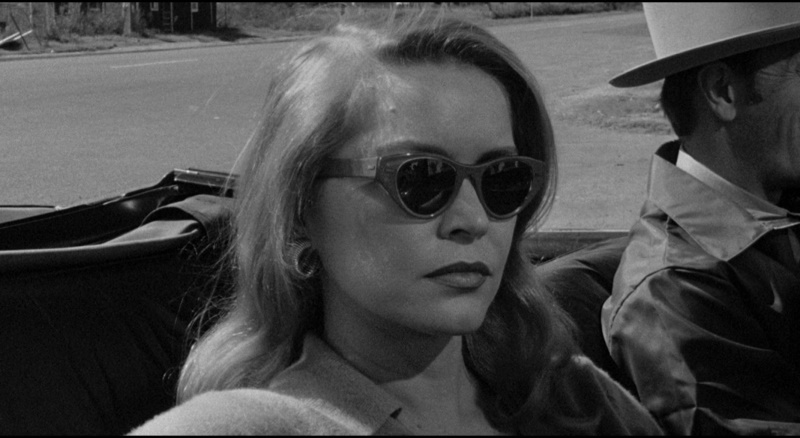 It looks fabulous in motion - the best, by a wide margin, that I have ever seen The Last Picture Show. Textures on walls, and fabrics is much more apparent than on SD. 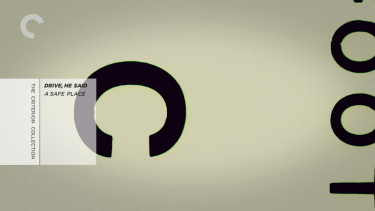 Criterion remain faithful to the original mono audio with a lossless linear PCM track at 1152 kbps. It gives some perceived depth and exports the dialogue consistently. Like all the transfers here - English subtitles are optional. Possibly the most fondly remembered film in the boxset and favorite of many - the supplements are pleasantly 'stacked' to the rafters. 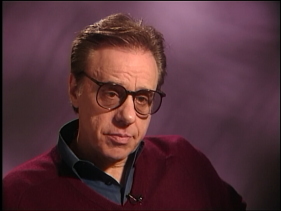 There are two audio commentaries, one from 1991, featuring Bogdanovich and actors Cybill Shepherd, Randy Quaid, Cloris Leachman, and Frank Marshall; the other from 2009, featuring a lone Bogdanovich. 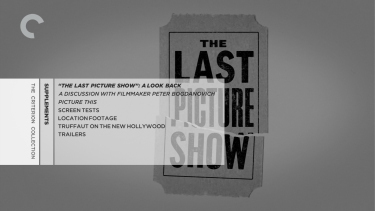 “The Last Picture Show”: A Look Back, is an excellent hour-long documentary from 1999 directed by Laurent Bouzereau. 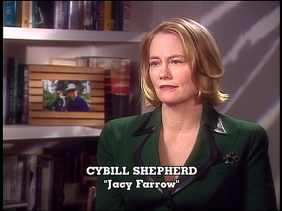 It details how the film as made - from casting to the decision for black and white over color and features interviews with Bogdanovich, Cybill Shepherd, Timothy Bottoms, Jeff Bridges, Ellen Burstyn, Cloris Leachman, and Frank Marshall. Also included is Picture This - a 40-minute, award-winning documentary, from 1990, directed by George Hickenlooper with the cast revisiting Archer City to shoot, the sequel, Texasville. It exposes some of the conflict that occurred behind the scenes of the first film. 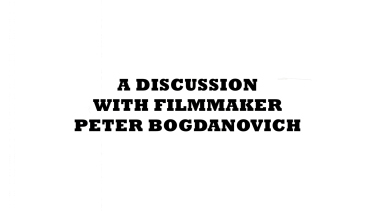 There is a Q&A from 2009 with Bogdanovich. 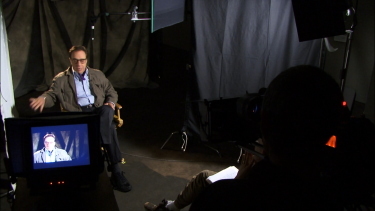 It lasts about a dozen minutes as he is questioned about his favorite filmmakers and inspirations - compiled by Laurent Bouzereau. 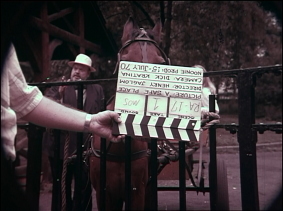 There are and some brief screen tests shot on 16mm and some, soundless, location footage. 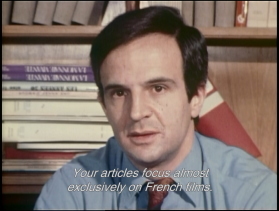 We also get 4-minutes of excerpts from a 1972 television interview with director Fran�ois Truffaut about the 'New Hollywood' as well as theatrical trailers - the original (3:05), and the re-release (1:28). Description: For his electrifying follow-up to the smash success Five Easy Pieces, Bob Rafelson dug even deeper into the crushed dreams of wayward America. 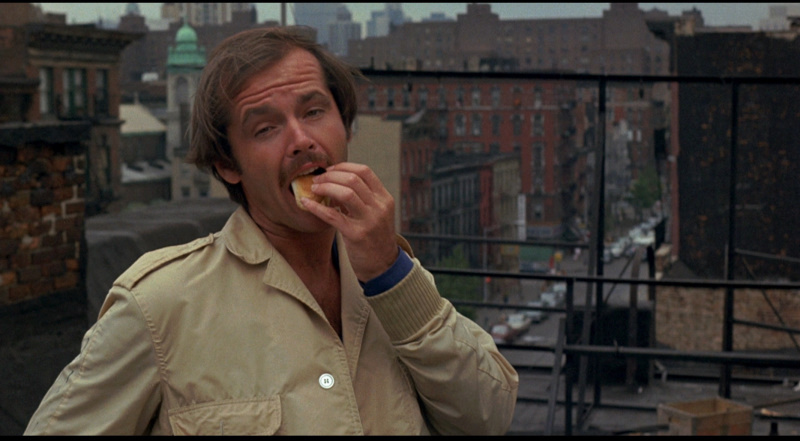 Jack Nicholson and Bruce Dern play estranged siblings David and Jason, the former a depressive late-night-radio talk show host, the latter an extroverted con man; when Jason drags his younger brother to a dreary Atlantic City and into a real-estate scam, events spiral toward tragedy. 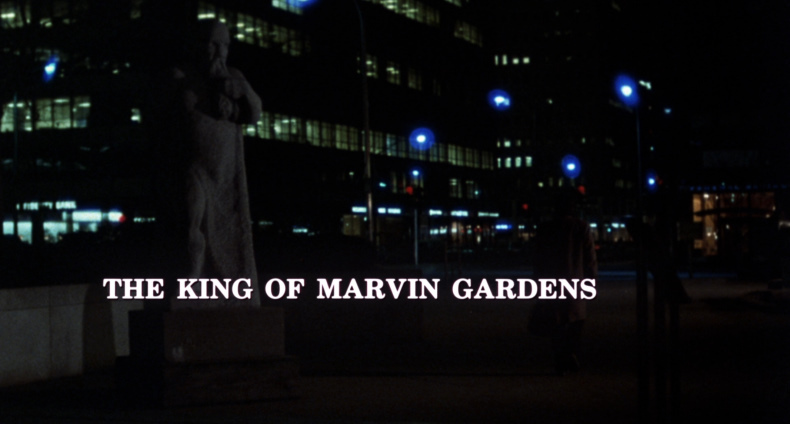 The King of Marvin Gardens, also starring a brilliant Ellen Burstyn as Jason’s bitter aging beauty-queen squeeze, is one of the most devastating character studies of the seventies. 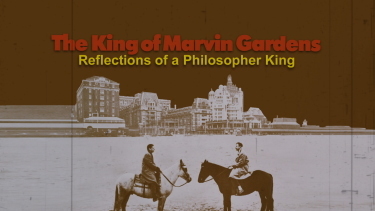 You will not find Marvin Gardens on a map. You will find it on a Monopoly board—between Water Works and Go to Jail—and its king, Jason Staebler, you will find in some country of the mind known best to desperate scenarists. 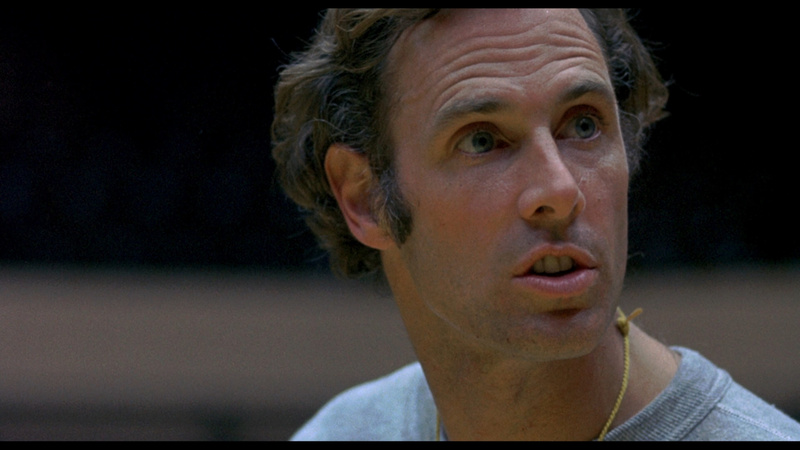 Jason (Bruce Dern), an artist, a visionary, dreams of buying an island ("Off the coast of Hawaii") but actually fronts for a mob in Atlantic City, where he occupies some hotel rooms with his girl, Sally (Ellen Burstyn), and his other girl, Sally's stepdaughter, Jessica (Julia Anne Robinson). To Jason comes David (Jack Nicholson), also an artist, his kid brother. David is supposed to help finalize the Pacific island plans, but actually he oversees the insubstantial kingdom of Jason until its tragic, but less than inevitable, end. An irresistible movie, not least for its haunting vision of Atlantic City as Xanadu, a stately pleasure dome of genteelly decaying palaces, run-down funfairs, and empty boardwalks presided over by white elephants abandoned to their brooding fate. It's like some unimaginable country of the mind, and so in a sense it is as two brothers embark on a sort of game (Atlantic City provided the original place names for the Monopoly board) in which they exchange their lives, their loves and their dreams. One has retreated, like Prospero, from the pain outside into the island of his mind; the other pursues an endless mirage of get-rich-quick schemes which will let him escape to an island paradise. Their fusion is a stunningly complex evocation of childish complicity and Pinterish obsessions, inevitably leading to tragedy as the obsessions founder on reality. One of the most underrated films of the decade. Image /Audio: This Blu-ray has a nice realistic feel - not an abundance of depth but very clean and consistent. 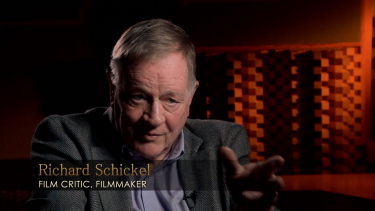 This is the 3rd transfer stated as '...supervised by director of photography L�szl� Kov�cs' whom we lost in 2007. 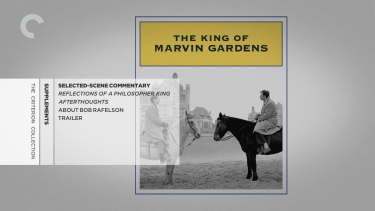 This Blu-ray probably looks like the film The King of Marvin Gardens. It is fairly dark, heavier earthy browns, but detail is solid in close-ups and overall it appears very film-like with a fine sheen of grain. This is easily the best home theater representation of the The King of Marvin Gardens. Again Criterion don't deviate from original audio with a LPCM mono track at 1152 kbps that is free of hiss or dropouts and dialogue is easily discernable. This Blu-ray supports a fine presentation. We get over an hour's worth of selected-scene commentary discussion featuring director Bob Rafelson. 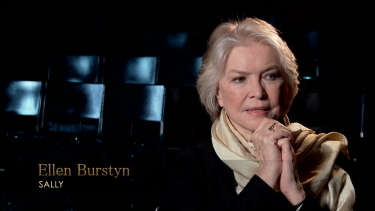 There is a 10-minute 2009 piece of recollections by Rafelson and actress Ellen Burstyn entitled Reflections of a Philosopher King. Also included is Afterthoughts, a 2002 interview with Rafelson, discussing the style and processes of the film with Kov�cs, and actor Bruce Dern - running 11-minutes. 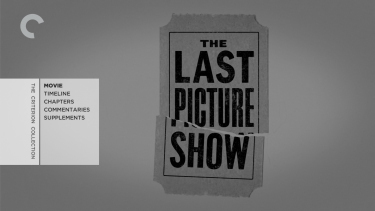 Those seeking more about the director can peruse some text screens 'About Bob Rafelson' and there is, lastly, a theatrical trailer running 3.5 minutes. Near the end of the calendar year there are made available some hefty digital-film packages. Last year, 2009, Criterion brought is their incredible AK 100 - 25 Films of Akira Kurosawa DVD boxset. In 2008 Fox gave us the monumental Murnau, Borzage and Fox Box Set and in 2007 it was Ford at Fox. All magnificent. This year there was some mild interest about the 18-DVD-disc The Elia Kazan Collection but I think the torch has been irrevocably passed on to the Blu-ray format. 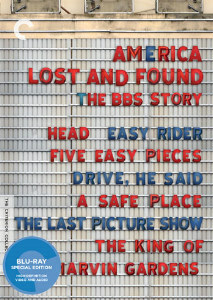 The America Lost and Found: The BBS Story Blu-ray Boxset is 'the' package of the entire 2010 year! 7 films linked by a commonality - part of an important renaissance of cinema. We have a collection of unforgettable movies unrestrained by the era - bursting forth a 'New Hollywood'. AND in 1080P resolution looking and sounding better than they ever have for home theater enjoyment. Top that off with the inclusion of over 20-professionally-detailed hours of probing, informative, and educational digital supplements and a marvelous 114-page keepsake book featuring color photos and essays by critics J. Hoberman, Chuck Stephens, Matt Zoller Seitz, Kent Jones, Graham Fuller, and Mark Le Fanu. 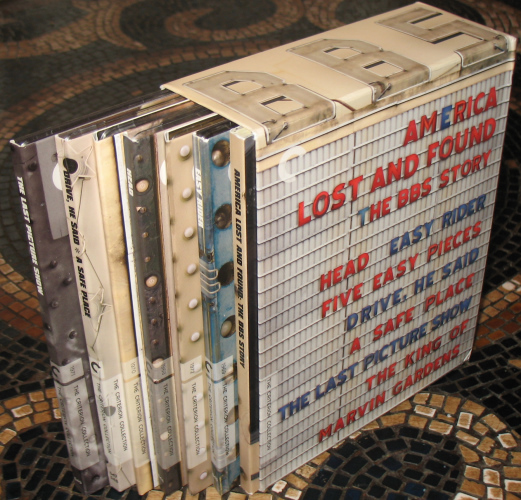 I like to think I see everything worthwhile that comes out and, in my opinion, America Lost and Found: The BBS Story Blu-ray Boxset is the most impressive cinephile package of 2010.